Former minister Savior Kasukuwere (file photo). "On this issue, I find the fact that the second respondent (Mr Macharaga) is officially delegated authority to prosecute by the Prosecutor-General is suggestive that there are no prospects of success on this point," he said. Justice Wamambo considered the alleged infringement of Kasukuwere's fundamental rights of particularly allegations of bias on the part of the presiding magistrates, among others. "After considering the application for review and the prospects of success, I find that there are slim prospects of success on review," he ruled. "To that end, I am of the considered view that the application for stay of proceedings pending review is unmeritorious." 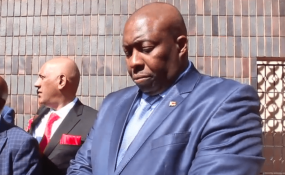 Kasukuwere, who was being represented by Advocate Thembinkosi Magwaliba instructed by Mr Charles Chinyama, wanted the higher court to review the Mujaya ruling in which he threw out the politician's application for exception to the criminal charges. Kasukuwere accused Mr Mujaya of being biased.